The Black Duck will always hold a special place in my heart. it remains the most abundant puddle duck on Long Island. In addition to hunting the when I was growing up, many times my Dad and we kids would just go park somewhere at dusk and watch them come into the meadows around East Islip’s shoreline. 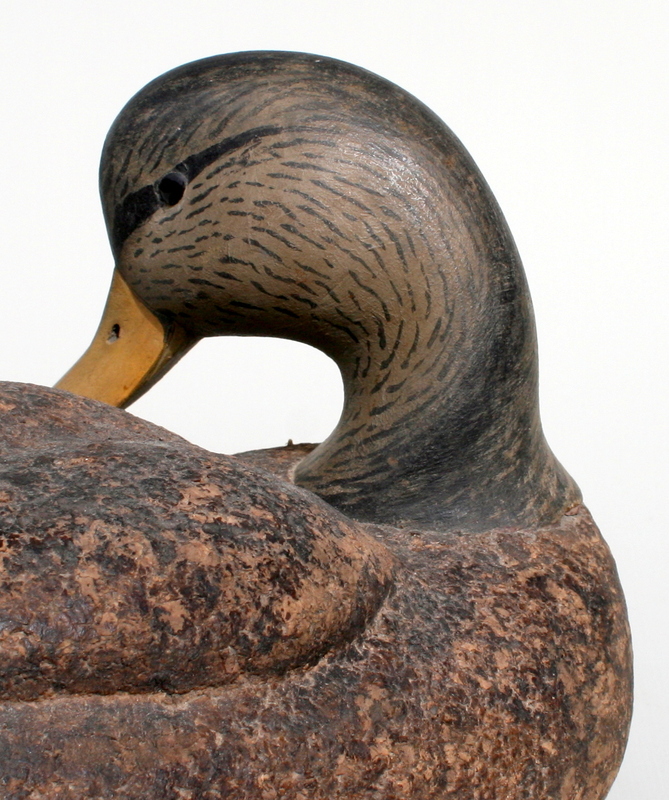 The first gunning decoys I carved were Black Ducks and, as a biologist I got to study and band Black Ducks for several years. 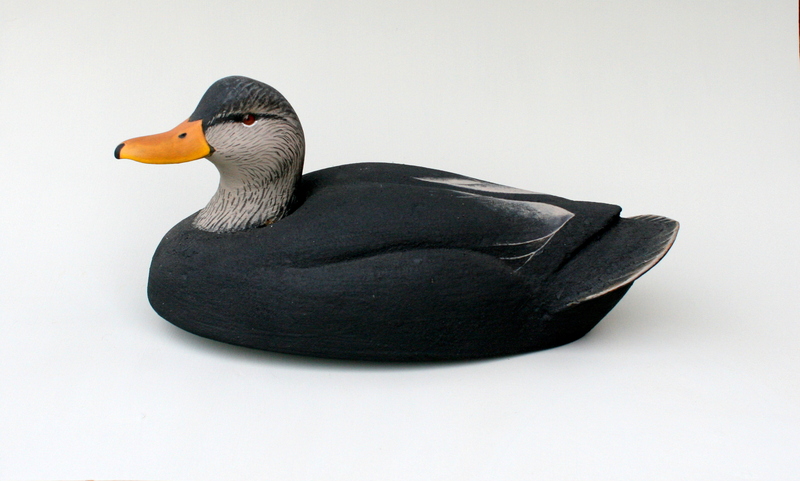 I have carved only a couple of decorative Black Ducks – years ago – and have no photographs of them that I can find. I do plan to carve some over the next year. I shot my first Black Duck – with a .410 Mossberg bolt-action – on my second day afield with a gun. My Dad and I were rigged in the meadows at the mouth of the Connetquot River, on the Great River side. Forty-eight years later – my first season with a gun was 1965 – the memory remains crystal clear. 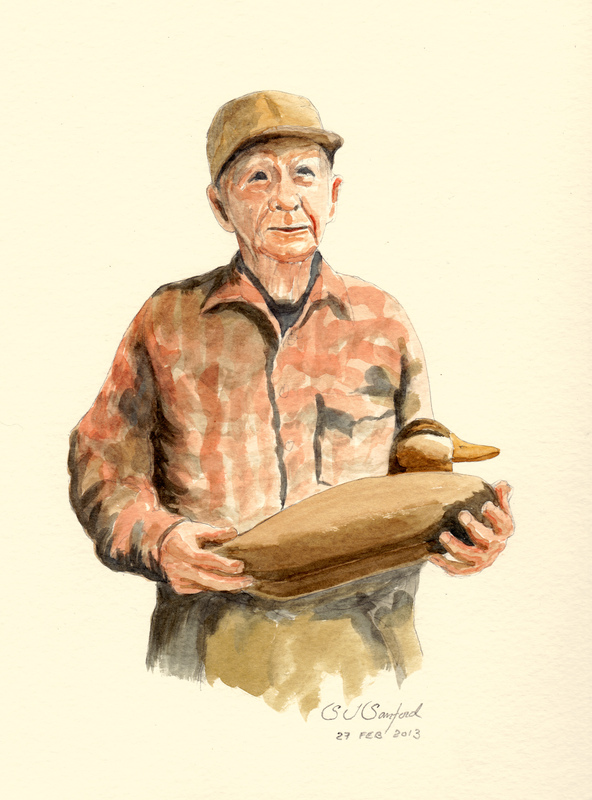 This painting of Long Island’s Mr. Decoy – Al McCormick – is from a photo taken in the early 90s, at the dedication of the Al McCormick Habitat restoration Project on Grass Island (Great South Bay). The drawing is from a bird in my collection. Although I never carved with Al, I remember seeing his birds for the first time. I loved the wide heads and fat cheeks. 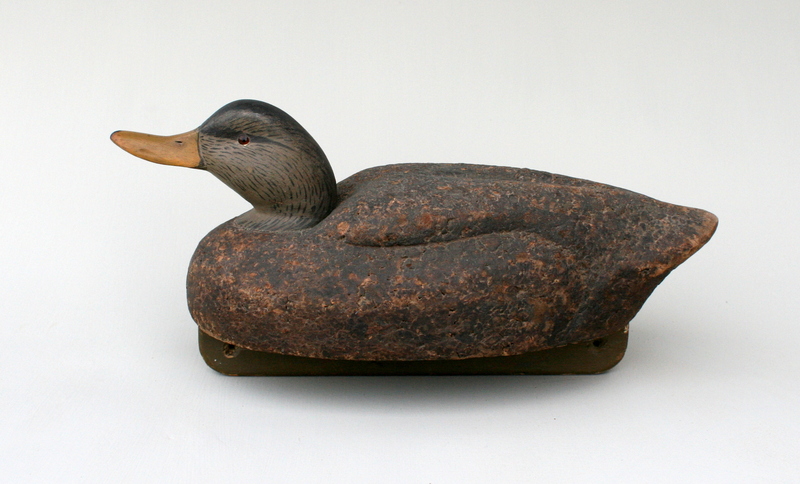 I had grown up gunning over first Herters Model Perfect balsa decoys and later Wildfowler cork birds. 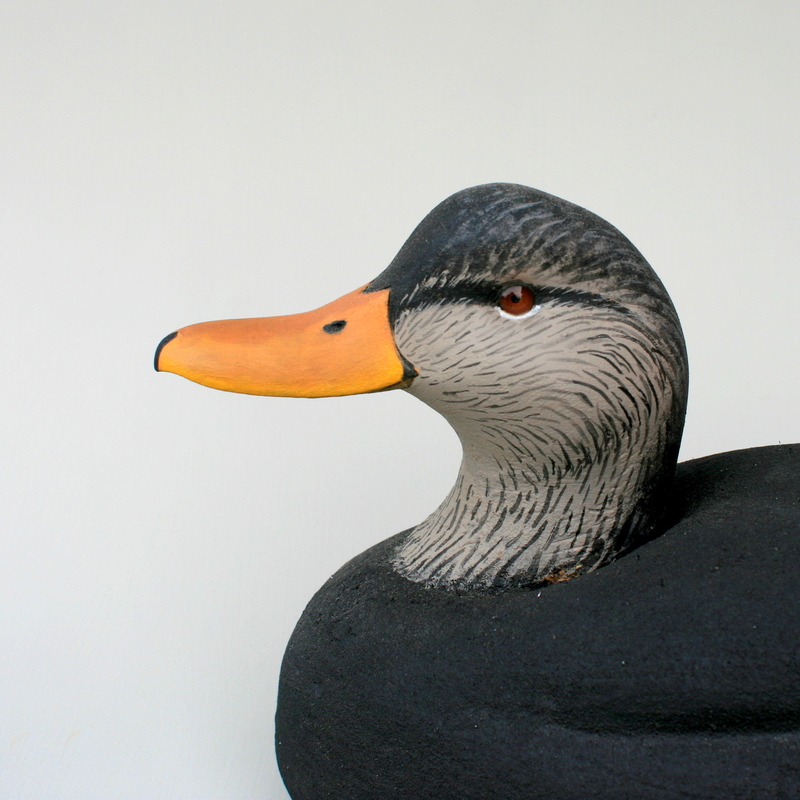 Both were nice decoys – the Herters were stolen from our boat – but their heads were too narrow to my eye. 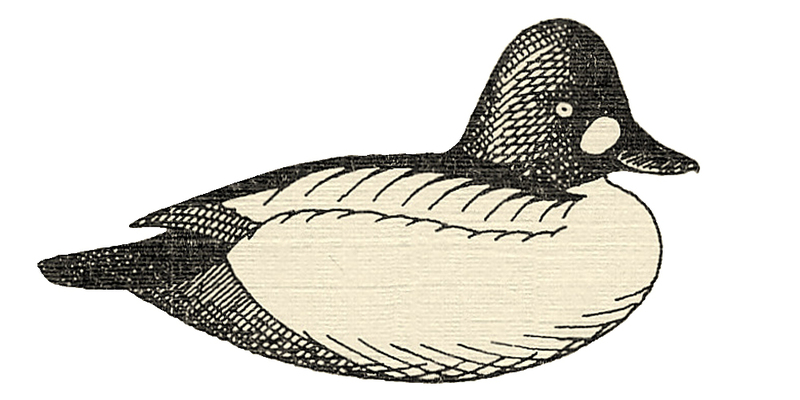 It seemed that they were surely sawn out of dimension lumber and did not capture the “bullneck” of a hunkered down late-season Black Duck. This Preener is one of 10 floaters I made for my saltwater rig; I also made 2 standing birds, a Sleeper and a Rester. I used “tan cork” from Wiley’s Cork Company; the heads are White Pine. The keel is Yellow Pine with poured lead ballast. The cork bodies were rubbed with linseed oil and then set fire with a Bernzomatic torch. I covered the heads with tinfoil and kept a rag handy during the process. The burned cork is rubbed down to give a finish that is very difficult to distinguish from the live bird. More than once, I have had birds in th rig that went to sleep among the stool. I would have difficulty picking such birds out from my Sleeper decoys. In fact, the last time I hunted as a resident of Long Island – I moved to take a job in Albany in late 1994 – I lost one of the 10 floaters on opening day. In early afternoon, I noticed what I thought was a sleeping Black Duck about 200 yards below my rig. I scolded myself for not having noticed it when it arrived. I soon ignored it. Later, though, when picking up the rig, I only counted 9 Blacks. The 10th was one of my sleepers. The point I was gunning had a habit of letting masses of sea lettuce (aka Ulva, “cabbage”) drain along the bottom on the outgoing tide. A line and weight could be overwhelmed by a basketball-sized wad of lettuce dragging it along. Such was the fate of my Sleeper. This is the Drinker from the same rig – one of my favorite poses – and the bill NEVER gets iced up! 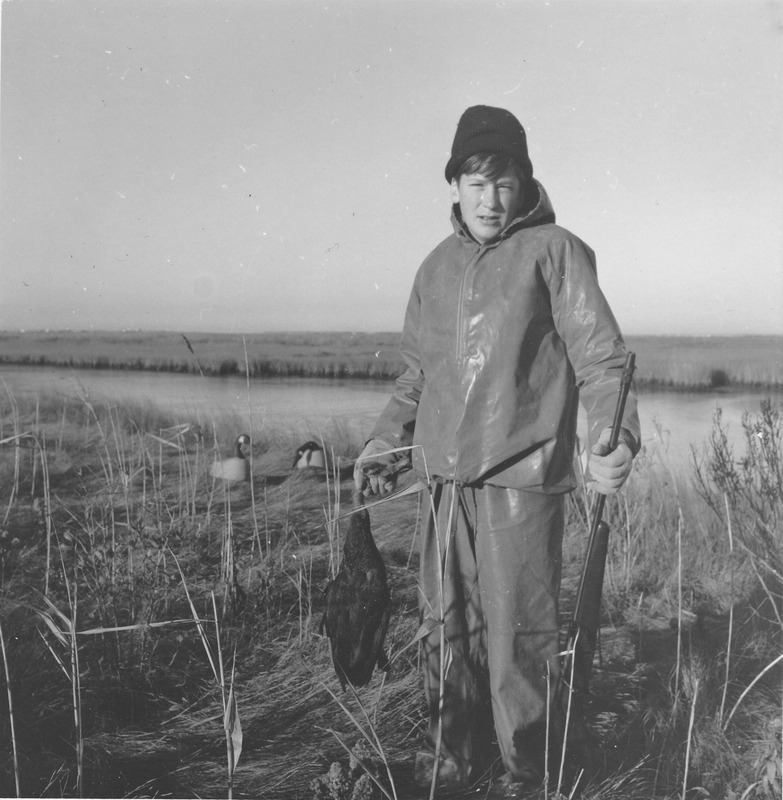 Once I moved north to smaller freshwater hunts, I bought some E Allen birds through Lou Tisch. I believe the master for these birds was carved by Keith Mueller. I paint them very simply, spending time only on the faces. 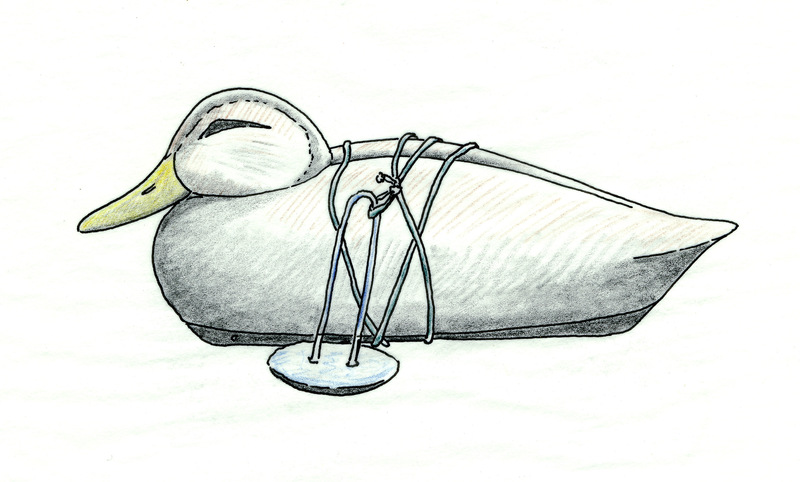 I use 1-ounce sinkers as weights because wind and tide are seldom an issue in the beaver ponds and marshes where i use them – and often have to carry them in. 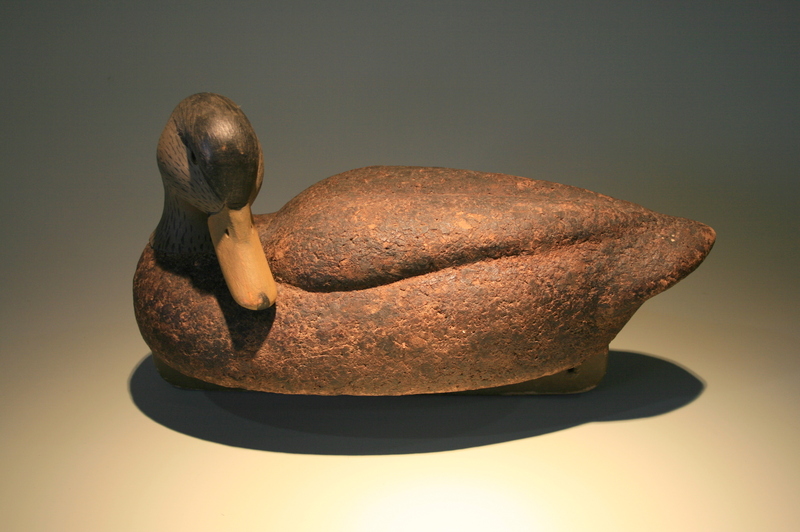 This bird is one of the first “foamers” that I have carved. I enlarged my pattern to 140 % – and so the body is 18 inches long and almost 9 inches wide. The foam body is protected with two coats of thickened epoxy. The second coat is covered with fine sawdust while the epoxy is still wet. The sawdust absorbs the epoxy and hardens with a rigid, coarse surface that is a perfect, shine-free base for paint. I poured a mushroom-shaped ballast weight that screws into the plywood bottom board. In tidal areas it is useful if the decoys do not tip on their sides when the water runs off the flats. 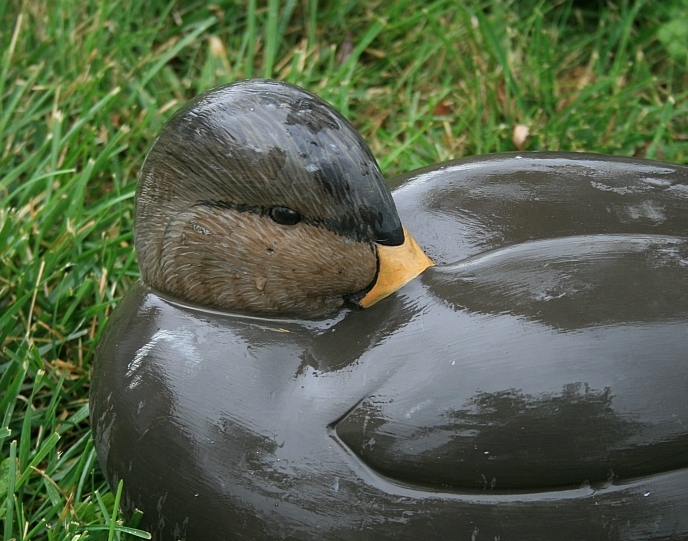 Painting the faces of Black Duck gunners is one of life’s finer pleasures. I enjoyed all the birds above but your preener is especially clean and elegant. I’ve just recently started carving again and would like to try and carve a bird or two in that position. Do you have any other photos of that bird from various angles? It is beautiful.